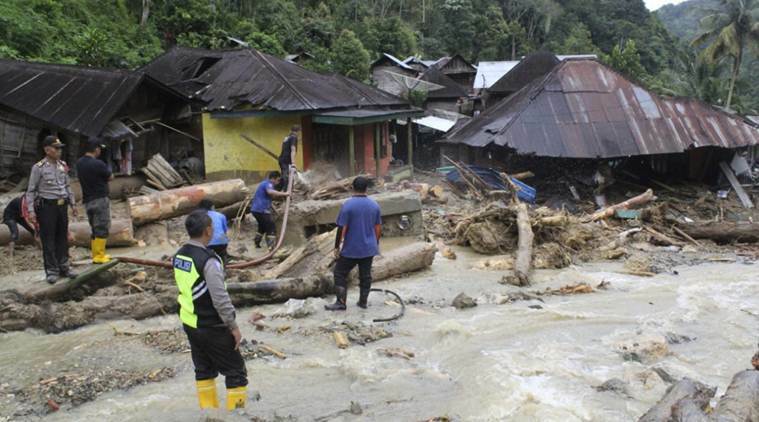 A flash flood with mud and debris from landslides struck Mandailing Natal district in North Sumatra province and smashed an Islamic school in Muara Saladi village, where 29 children were swept away on Friday afternoon, said local police chief Irsan Sinuhaji. Jakarta: Torrential rains triggered flash floods and landslides on the Indonesian island of Sumatra, killing at least 27 people, including a dozen children at a school, officials said Saturday. He said rescuers retrieved the bodies of 11 children from mud and rubble hours later. The National Disaster Mitigation Agency’s spokesman, Sutopo Purwo Nugroho, said rescuers and villagers managed to rescue 17 other children and several teachers on Friday and pulled out the body of a child on Saturday near Aek Saladi river, close to the school. A video obtained by The Associated Press showed relatives crying besides their loved ones at a health clinic where the bodies of the children were lying, covered with blankets. Nugroho said two bodies were found early Saturday from a car washed away by floods in Mandailing Natal, where 17 houses collapsed and 12 were swept away. Hundreds of other homes were flooded up to 2 meters (7 feet) high, while landslides occurred in eight areas of the region. Four villagers were killed after landslides hit 29 houses and flooded about 100 buildings in neighbouring Sibolga district, Nugroho said. He said flash floods also smashed several villages in West Sumatra province’s Tanah Datar district, killing five people, including two children, and leaving another missing. Landslides and flooding in the neighbouring districts of Padang Pariaman and West Pasaman killed four villagers after 500 houses flooded and three bridges collapsed. Both North and West Sumatra provinces declared a weeklong emergency relief period as hundreds of terrified survivors fled their hillside homes to safer ground, fearing more of the mountainside would collapse under continuing rain, Nugroho said, adding that dozens of injured people were rushed to nearby hospitals and clinics. Seasonal downpours cause frequent landslides and floods each year in Indonesia, a chain of 17,000 islands where millions of people live in mountainous areas or near fertile flood plains.